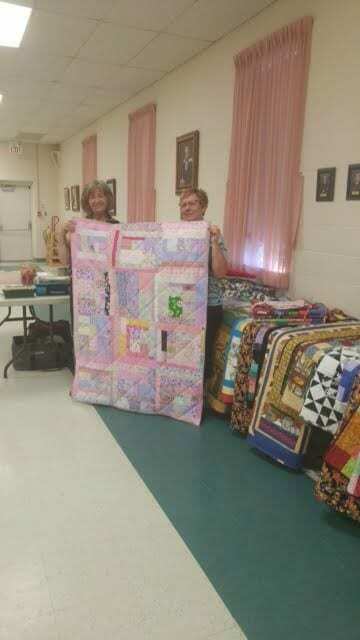 The mission of Quilts of Valour – Canada is to present quilts to injured or ill military members, past and present. At this time, Canada has over 45,000 injured veterans (average age of 45). To date, Quilts of Valour – Canada (QOVC) has presented close to 12,000 quilts. Our goal is 20,000 by 2020. We have a long way to go. In 2019, Quilts of Valour will be celebrating its ten year anniversary as a nonprofit society. QOVC is hoping you will help us celebrate by making log cabin blocks /or finished quilts for our injured military members. The block is an unfinished 10 1/2 inch log cabin block made in reds and whites representing Canada with a yellow centre representing a light in the window/welcome home. Click here for the block pattern. We will be inviting a number of distinguished and celebrity guests from the Ottawa area to sew pre-cut log cabin blocks at the booth; each guest will have a sewing coach to help with the block. Drop by our booth at Quilt Canada 2019 to encourage our guests as they try their hand at this art form. Check the Community Outreach page to see the link for an update of our Guilds Contributions. Thank you to everyone who makes this possible. 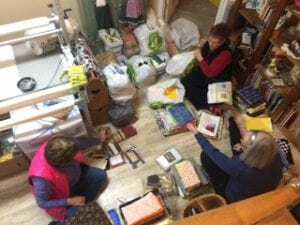 On January 8, 2019 members met to sort through our latest fabric donations. We use and appreciate all quilting appropriate fabrics and batting for our Quilts of Comfort and Day for Girls Community Outreach projects. Thank you to the generosity of our donors. 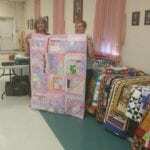 Aside from sorting items we also created 39 kits for quilting and 25 kits for piecing. Our next Sit ‘n Sew is Jan 26, 2019 at Living Faith Community Church in Baxter. Our first guild meeting of the year is Feb 5th. Our Days for Girls liaison, Adriane, will join us again for our November guild meeting. She will bring us up to date on their latest projects and will collect our completed bags, liners and other donated items. “Girls briefs (size 10, 12 and 14) and washcloths are always our greatest needs. Bag and liner kits will be available at the October meeting, and please remember to bring your completed items or other donations to either the October of November guild meetings. Thanks to all who continue to support this initiative. Please have a look at the Community Outreach page for an update on contributions made by our guild. 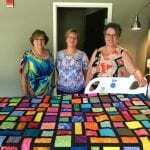 Ten quilts, made by members of Quilting Corners Guild, were delivered on July 10th to Matthews House Hospice in preparation for the grand opening of the new facility this Thursday. We had a sneak peek and were in awe of the wonderful building and grounds that will offer a variety of services to the local community. 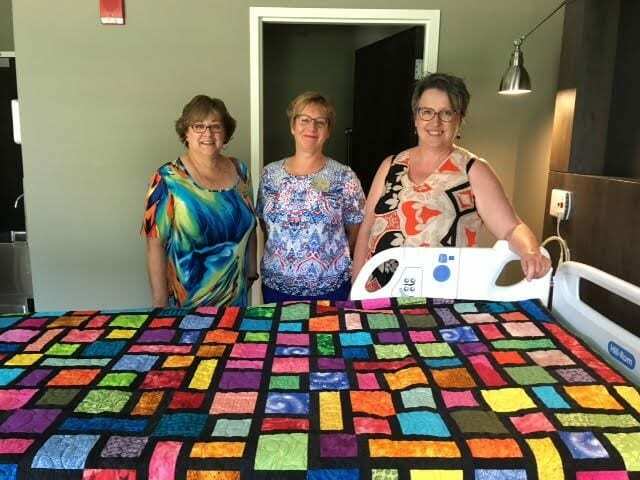 Pictured below is one of the quilts on a resident bed received by Kim Woodland of Matthews House with Cheryl Dobo and Senora Baldry of Quilting Corners Guild. Another bountiful donation was made to My Sister’s Place at our July guild meeting. Forty-five quilts, varying in size from baby to large lap, were created by our many guild members busy hands. Pictured below are Sheila Cormier, MSP and Senora Baldry, Community Outreach, QCG. …has been updated to include an upcoming show! Check it out!